Afrima has structured the business by forming partnerships with local and foreign companies. 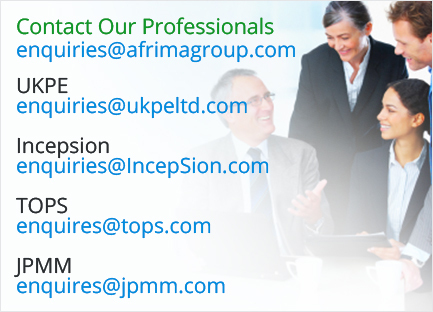 Currently Afrima have partnered with few companies namely TOPS, JPMM, Incepsion and UKPE. TOPS is a training provider and project management consultant. JPMM is local (Bumiputera) civil and electrical consultant in Malaysia. IncepSion Consultants is a Malaysian company which provides engineering consultancy services and mainly focuses on geotechnical engineering. UK Power Engineers Ltd is another partner which is registered in UK and based in London, responsible to provide engineering consultancy services for the European market and also to provide specialist engineering and management skills. We offer services as detailed design consultancy, EPCM, Lenders, Third Party Consultant, Sub-consultant and Owners Engineers for many projects, locally and globally. We have wealth of knowledge and experience within the industry, to cater for our client’s needs. At Afrima Consulting Engineer, we aim to develop innovative solutions for clients by leveraging our experience and effective approach to produce efficient, professional, value added and cost efficient solutions that assist clients to achieve desired results. Professionals within Afrima Consulting Engineer have vast experience in providing services within Power sector whereas with partnership of IncepSion and UKPE, the experience spreads even wider up to servicing sectors and industries including government, commercial & residential building and construction, property, civil infrastructure, marine and power infrastructure. With such vast combined experience in regional projects to international Power infrastructure projects, Afrima Consulting Engineer can be the dream partner to deliver power and energy related projects to the client.